Home / News / APC Congress: Forum Laud's Saraki's, Gov Ahmed's leadership, Congratulates New Excos. APC Congress: Forum Laud's Saraki's, Gov Ahmed's leadership, Congratulates New Excos. 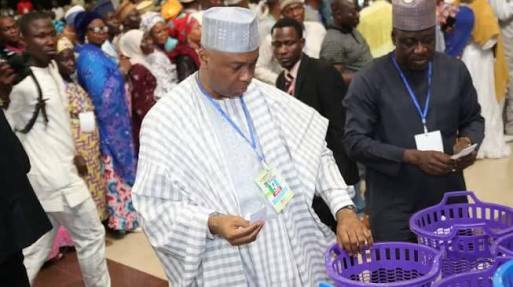 The forum of former legislators of the Kwara State House of Assembly, under the banner of All Progressives Congress, APC, has lauded the leadership of the Senate President, Dr. Bukola Saraki in ensuring peaceful coexistence in the All Progressives Congress (APC) in the State. The forum also congratulated the new APC executive members in the State on their emergence as the party's leaders, which it described as important to the party. In a statement jointly signed by the Chairman and Secretary of the forum respectively, Hon. Layi Ayinde and Hon. Isiaka Mogaji, the forum said the Senate President had distinguished himself through his leadership style which it noted prompted the peaceful conduct of the just concluded congress of the party. It described congress as the most credible and violence-free throughout the Country. It stated further that the Congress was a reflection of what happened at all levels of APC in the State which, the forum said, was largely due to the participatory approach in the selection and, subsequently election processes. “The successful ward, local government and state congresses were largely due to the peaceful environment and most importantly the participatory approach that the state party adopts”. The forum, while congratulating the new winners in the Congress urged them to justify the confidence reposed in them by the delegates. It also enjoined them to work together in order to ensure unity and progress in the party, so as to ensure electoral victory come 2019 general elections. The forum also called on all and sundry in the state to continue to give their unalloyed support to the government of the day in order to continue to enjoy dividends of democracy.